Common sense has a special place in modern politics. Politicians constantly appeal to it in their arguments, and they do so because democracy itself is founded on a faith in common sense. In 1776, for instance, Thomas Paine wrote, in his pamphlet Common Sense, that "simple facts, plain arguments, and common sense" would suffice to place the rights of the people above the rights of the king. The king, and many others, disagreed; and yet today common sense seems, so to speak, self-evident. The truth is, as usual, more complicated. 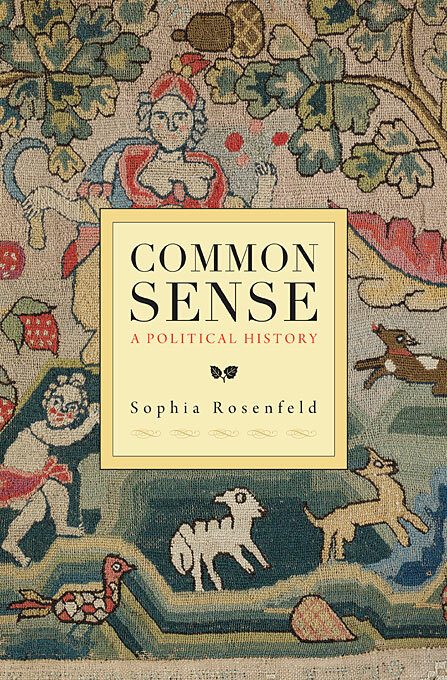 As Sophia Rosenfeld, a historian at the University of Virginia, shows in Common Sense: A Political History, common sense was invented by scientists, philosophers, and politicians. It only seems self-evident now because the idea of common sense presents itself as common-sensical, as though everyone, were he not disabused of the notion by experts, would know that he possessed it. Common sense is, as she puts it, a "slippery" idea -- the kind of idea that covers its own tracks. Rosenfeld's account of common sense centers on the eighteenth century, when common sense and the scientific method both got their starts. Both ways of thinking about thinking, she writes, began with "a Protestant emphasis on direct, experiential knowledge, simplicity, and the value of 'ordinary life.'" Enlightenment thinkers, who championed reason over tradition and superstition, often cited something not unlike common sense as the quality that authorized them to set aside received ideas and come to their own conclusions. But that alliance was not to last. Science became increasingly specialized, and thinking, especially in print, more rigorous, complicated, and systematized. The idea of common sense moved more firmly into the political sphere, and was increasingly used in what, today, we'd call a "populist" way. Today, common sense is often opposed to expert opinion. Rosenfeld ties her story to a number of large historical developments throughout the seventeenth and eighteenth centuries. Living in thriving, cosmopolitan cities gave ordinary people the sense that their (actually very local) intuitions might be universally true. Well-educated media types -- think Thomas Paine -- began presenting themselves as representatives of "the people," in an effort to find a middle position in an economically stratified society. And people in authority, overwhelmed by an explosion of books and pamphlets, began using the idea of "common sense" to disqualify ideas they didn't like as absurd or inappropriate. What emerges from this history is that, as Rosenfeld puts it, "common sense is almost never fully consensual;" instead, ideas about what's common-sensical are "almost always polemical." And, of course, the forces Rosenfeld cites still swirl around the idea of common sense as we know it today. Know-it-all urbanites, class-conscious writers, and defensive cultural authorities are still laying claim to the common sense that "ordinary folks" supposedly share. All of this makes you wonder: just what is democracy based on, if common sense is never what it seems? The answer seems to be that it's based, in the end, only on a naive hope that something like common-sense exists -- that there really is an outlook we can all share, more or less, and which is above the divisions of class and race and immune to the manipulations of people with bad intentions. To understand how democracy works, you have to understand the way that the crazy dream of common sense is nurtured, maintained, exploited, and defended.